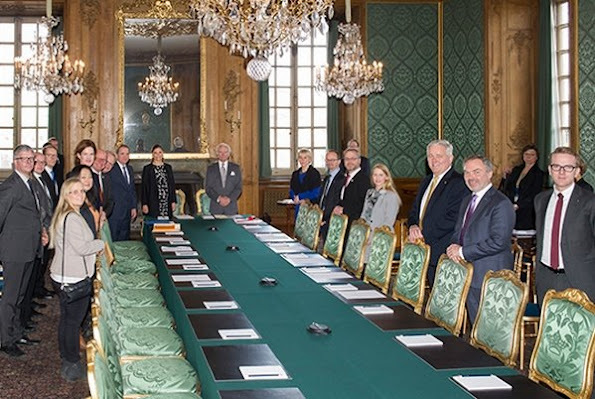 On February 22, Monday, a consultative committee meeting of Foreign Relations Committee was held at Stockholm Royal Palace. The consultative committee meeting was attended by King Carl Gustaf and Crown Princess Victoria of Sweden. She sure is pushing it! Hard worker. She should take the time now to spend with Estelle before the new baby arrives. I think she deserves a rest! Absolut! Sie sollte wirklich kürzer treten. Will sie sich und der Welt beweisen, dass sie bis kurz vor der Niederkunft arbeiten kann...? Ach naja, sie nimmt ja nur noch Termine im Schloß wahr, die vermutlich auch nicht länger als eine halbe Stunde dauern. Also das ist schon vertretbar. Trotzdem vorbildlich im Vergleich zu anderen royalen Damen. Come on she survives a little meeting. As second in command she has to attend! It's not harder to go and sit at this meeting for a short while(15-30 min max) then it is to sit at the dinner table. It's not excatly hard work. I like the dress. At least Victoria wears maternity. We had to get in a bad comment about her sister in law...This is a form fitted tight dress...no comment about that hah? Guess you are trying to dish Sofia, but pretty stupid comment when we know that her red dress came from Id Lanto and was specially tailored to fit the stomach . I thought she had stoppd attending meetings. Maybe her home life is boring? But she should spend more time with her daughter before the baby is born. Work-work-work until one hour before you have that baby. Then back at work two days later if you're a CEO or an auto mechanic. The "pregnancy isn't an illness" cheerleaders expect nothing less from "modern women". No, pregnancy isn't an illness, but the same people (not necessarily on here) who say pregnancy is normal are admiring her for working so close to her due date, whenever that is. Regarding Victoria, I do believe she wants to repeat what happened with Estelle's birth and show up for events until a day before giving birth.